This paper investigates the scheduling problem in a typical flexible manufacturing system (FMS) with routing flexibility. The scheduling decisions have been established in terms of how the parts are launched into the system, how these parts are routed through various machines and how parts are sequenced for processing on a machine. The first decision is taken using one of the two dynamic dispatching rules (least work remaining (LWR) and most work remaining (MWR)) or first in first out (FIFO). Concerning the second decision, an algorithm based on particle swarm optimization (PSO) is used for real time alternative routing selection of each part whereas shortest processing time (SPT), longest processing time (LPT) and FIFO are used as sequencing rules for working centres (third decision). The simulation results evaluated in terms of the productivity and the utilisation of the system show that the proposed PSO algorithm performs the best when it is combined with LWR as part launching rule and SPT as machine sequencing rule. In the last decades, due to the increasing trend towards medium volume – medium variety production, low costs and shorter lead times in the market place, manufacturing companies were forced to implement systems that can work on small batches and have low set up times and provide flexibility and efficiency. This type of systems is known as flexible manufacturing system (FMS). These systems have been defined in a number of ways but despite the range of existing definitions in the literature, it is accepted that an FMS is composed of some elements: computer numerically controlled (CNC) machine tools, linked by an automated material handling system, and a computer controlled network that coordinates the activities of processing stations and automated transport system and storage system etc. Sequencing of parts for processing at each machine (part sequencing decision). Because of their inherent complexity and the rapid changing of theirs status, the scheduling problems in such types of systems are known as NP Hard problems. Unlike several optimization techniques, metaheuristics are approximate algorithms of stochastic type, aiming to tackle hard and complex optimisation problems in different domains by providing acceptable solutions in reasonable time. Often inspired from analogies with reality or natural phenomenal such as ethnology (ant colony, particle swarm optimisation), they offer several advantages because they are easy to implement and can handle specific constraints in practical applications easily. Moreover, they are known by their ability to find good solutions to hard combinatorial optimization problems in short time periods, with no or little knowledge on the search space. On the other hand, they share also some drawbacks, among them: no guarantee or proof of optimality and sensitivity to their parameter tuning. This paper deals with a simulation study in an FMS that consists of seven machining centres, a loading and an unloading area and six different part types. Owing to the existence of identical machining centres, the part types have alternative routings. The operational control procedures are: launching of parts in the loading station of the system (part launching decision), routing of parts through various alternative machines (part routing decision) and sequencing of parts for processing on a machine (part sequencing decision). An algorithm based on particle swarm optimization has been adapted for solving the real time alternative routing selection problem for each part (part routing decision). The other decisions are taken using several part launching and sequencing rules. 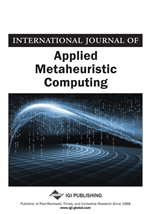 This study is conducted to investigate the effects of the parts launching and parts sequencing decision rules on the performance of the studied system when the above mentioned metaheuristic is applied for the real time part routings selection. The remainder of this paper is organized as follows. The next section provides a review of the related literature. Then, the simulation model developed in this study is described in section 3. Section 4 defines the operational control decisions of the system. The simulation results are presented in Section 5. Finally, section 6 presents the conclusions and recommendations for future work. Flexibility is an important feature that distinguishes FMSs from other manufacturing systems. So, to justify their relatively high investment, it is of utmost importance to make full use of the flexibilities that the FMS offers.